Last month saw the second anniversary of the start of the war in Yemen. Two years since a coalition of countries, led by Saudi Arabia, launched a military intervention aimed at forcing back Houthi rebel forces. Two years of crisis and conflict in Yemen. Two years of suffering a people who, already heavily dependent on food aid before the war, now face famine. And two years of unhalted arms exports to Saudi Arabia and other coalition forces, fueling this desperate human suffering in Yemen. As a widespread pattern of violations of human rights and the laws of war by the coalition in Yemen became clear, several countries have stopped their sales or otherwise restricted their export policies in line with their legal obligations under the Arms Trade Treaty (ATT). However, others like the UK, France, and the US, have continued to sell bombs, aircraft, and other weapons that could be used in further violations in Yemen by the Saudi-led coalition. Ignoring the evident pattern of death and destruction some of Saudi Arabia’s largest trade partners have continued to prioritize profit over human rights. UK NGO Campaign Against Arms Trade (CAAT) has mounted a legal challenge against the UK government’s decision to continue arms sales to Saudi Arabia. CAAT has asked for a judicial review of the UK government’s failure to suspend its export licenses to Saudi Arabia, and of a decision to grant new licenses for arms made in December 2015. The case was argued before the British High Court in February 2017, and a judgment is expected in the coming weeks. Since the war in Yemen began, the UK has sold more than £3.3 billion (USD $5bn) in arms and ammunition to Saudi Arabia. This includes agreeing licenses for more than £1bn of bombs, and another £1bn of combat aircraft – exactly the same types of weapons bringing devastation to the people of Yemen. The ATT forbids its States Parties from selling weapons if they would violate a range of international commitments and obligations, including where they would be used to commit war crimes or direct attacks on civilians. It also requires exporters to assess the risk of arms being involved in a serious violation of international humanitarian law (IHL) or international human rights law (IHRL). Experts have documented a widespread pattern of violations of IHL and IHRL by all parties to the Yemen conflict since the intervention began in March 2015. Saudi-led coalition forces have attacked The United Nations Panel of Experts in January 2016 identified more than a hundred coalition air strikes relating to violations of IHL. More than a year of bombing since has seen the widespread destruction of crucial infrastructure such as schools, factories, ports, markets, and hospitals, including with banned cluster munitions. Last December, the US halted its sale of precision-guided aircraft bombs because of “systemic, endemic problems in Saudi Arabia’s targeting,” and US lawmakers are currently challenging any effort to resume sales because of the likelihood of civilian casualties. 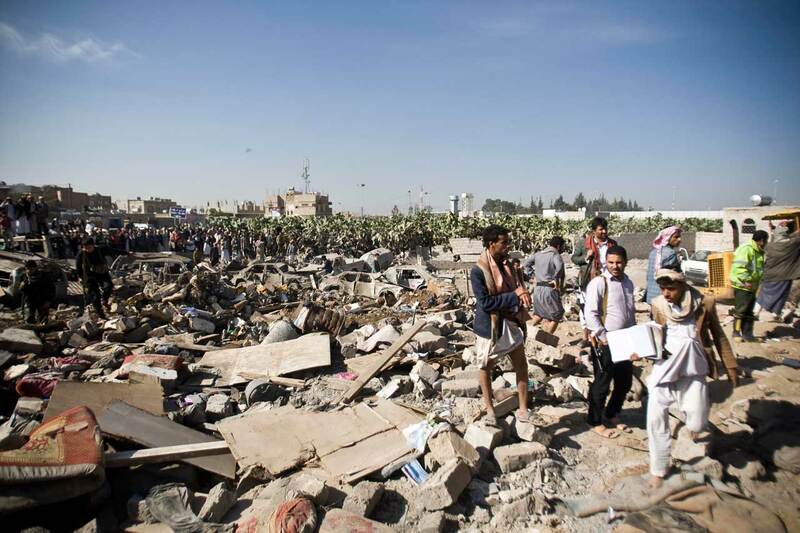 Lawyers representing CAAT revealed that the UK Ministry of Defense has itself been tracking at least 122 incidents in Yemen, and cannot identify any military target in around 90 cases. Despite this, and despite the clear risk of misuse in Yemen, the UK has continued to authorize new sales. The UK was a champion of a strong and robust ATT throughout the long negotiations. Now, it is one of its biggest violators. Regardless of the outcome of the court case itself, the UK government must immediately suspend the supply of all weapons capable of being used in Yemen, and revoke all outstanding licenses. Control Arms calls on all arms exporting states to cease supplies of weapons to any warring party in Yemen.